Q: Do you offer overnight shipping? A: No. Because of our remote location, the nearest city is 70 miles away, we do not offer overnight shipping. Q: Is there any options available for expedited shipping? A: Yes, we offer Priority Mail Express and Ups 2nd & 3rd Day Air. Because of our remote location on UPS expedited shipping add 1 day to any method chosen. Examples: 3 Day Air is actually 4 days, 2nd Day Air is actually 3 days. Q: Can I ship internationally through another service like UPS or DHL? A: No. As of now, all of our international shipments are via First Class, Priority or Express Mail. We do not have access to DHL or other shippers because of our remote location. Q: Can hazards be shipped via Priority Mail? A: No, hazardous materials can only be shipped via UPS Ground Services, because of this we do not ship hazardous items to Hawaii, or internationally. Hazards shipped within the continental US must be shipped via UPS Ground. 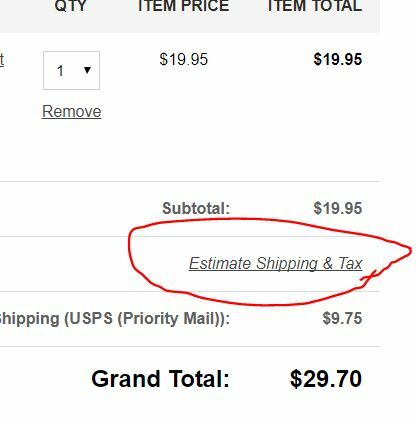 If this method is not chosen at time of checkout shipping will be recalculated as UPS Ground and purchaser will be charged for any extra shipping charges. Q: I need a shipping quote. How do I get one? A: On the website choose the items you would like to order then click "view/edit cart" on that page there will be a button that says estimate shipping, enter your state and zip code and it will give you pricing options for shipping. See picture below. Q: I am going to be in the area, can I pick up my order? A: Yes! However, pick up orders must be placed by phone and pick up time arranged. Please keep in mind that Photographers' Formulary is not open on weekends. We do not have a store front so orders must be placed ahead of time. Please call (406)754-2891.